Acclaimed 25-year-old American pianist Drew Petersen is a sought-after soloist, recitalist, and chamber musician in the United States, Europe, and Asia. Winner of a 2018 Avery Fisher Career Grant, the 2017 American Pianists Awards and the Christel DeHaan Fellow of the American Pianists Association, and also Artist-In-Residence at the University of Indianapolis, he has been praised for his commanding and poetic performances of repertoire ranging from Bach to Zaimont. Following a 2017-18 season that included Mr. Petersen's debuts with the Tucson Symphony Orchestra and Milwaukee Symphony Orchestra, performances with the symphony orchestras of Anderson (IN), Butler (PA), Carmel (IN), Adelphi (NJ), and solo recitals at the Gilmore International Keyboard Festival, Cleveland International Piano Competition, University of Indianapolis, Dame Myra Hess Concerts (Chicago), California's InConcert Sierra, Indiana's Purdue University Convocations, Parrish Art Museum in the Hamptons, and the Chopin Foundation of the U.S., highlights of Petersen's 2018-19 season include his debut with the Indianapolis Symphony Orchestra, Phoenix Symphony, Pacific Symphony, and Santa Fe Symphony, as well as debut performances at Ravinia Festival (Chicago) and Sunriver Festival (Oregon). Of note is Mr. Petersen's Summer 2018 debut album for the Steinway & Sons record label. The CD explores 20th- and 21st-century American piano music and features the monumental piano sonatas of Samuel Barber and Elliott Carter, and the world premiere recording of Judith Lang Zaimont's suite Attars. Also on the recording are works by Charles Griffes and Charles Ives. Summer 2017 saw Mr. Petersen embark on a six-recital tour of the Czech Republic. Returning to the United States, in Chicago he appeared in recital broadcast on WFMT’s “Impromptus” radio program, performed the featured solo recital at the 2017 National Conference of Keyboard Pedagogy, and was a Fellow of Ravinia’s Steans Music Institute. Past performances include recitals in numerous major halls of New York, as well as abroad at the Verbier Festival (Switzerland), Euro Arts Music Festival (Leipzig), Leeds Clothworkers Hall (UK), Tel Aviv Museum of Art, and IBK Chamber Hall of Seoul Arts Center. In his young career, Mr. Petersen has performed with over two dozen orchestras; other recent concerto highlights include performances with the Hallé Orchestra (UK), Park Avenue Chamber Orchestra (NYC), Westchester Philharmonic (NY), Hilton Head Symphony (SC), Columbus Philharmonic (IN), and New Jersey ensembles Symphony in C, the Westminster Symphonic Choir and Orchestra, and the Ridgewood Symphony. Drew Petersen’s performances are frequently broadcast on radio and television stations across America. He has performed on American Public Radio’s “Performance Today” and is a frequent guest on the McGraw-Hill “Young Artists Showcase,” hosted by Robert Sherman and aired on New York’s WQXR. As a young pianist, Drew was heard on NPR’s radio program “From the Top” featuring the nation’s most gifted young classical musicians, and his unique gifts have been profiled in The New York Times, New York Magazine, and the documentary "just normal" by award-winning director Kim A. Snyder. Mr. Petersen has also appeared live on French radio "France Musique," as a member of a piano trio at Switzerland's Verbier Festival. As a collaborator, Mr. Petersen is a perennial guest artist with the Jupiter Symphony Chamber Players in New York City, and frequently appears in recital internationally with acclaimed violinists Bomsori Kim and Itamar Zorman. Under the auspices of the American Pianists Awards in April 2017 he performed Franck’s Piano Quintet with the Pacifica Quartet and a recital of American art songs with baritone Andrew Garland. In March 2019 Mr. Petersen will perform a recital with the Indianapolis Quartet, the resident string quartet at the Univeristy of Indianapolis. 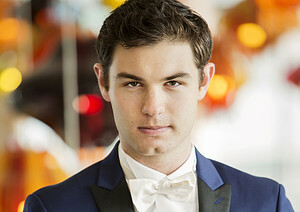 Recipient of numerous honors and awards, at age 21 Drew Petersen won 4th prize in the 2015 Leeds International Piano Competition, and he is the 2016 winner of the Sanders-Juilliard-Tel Aviv Museum Prize. He is a laureate of the Hilton Head International Piano Competition, Kosciuszko Foundation Chopin Piano Competition, NY Fryderyk Chopin Piano Competition, and the Friday Woodmere Piano Competition. Mr. Petersen first began his career path at the age of five, when he was presented at Carnegie’s Weill Recital Hall, and following a few years later at age nine with a solo recital at Steinway Hall in Manhattan for Steinway & Sons’ 150th Anniversary. Drew Petersen is currently a candidate in the Artist Diploma program at the Juilliard School, studying under Robert McDonald. He received his Master’s degree from Juilliard as a proud recipient of the prestigious Kovner Fellowship, and was awarded Juilliard’s Arthur Rubinstein Music Prize upon graduation. He also holds a Bachelor’s Degree from Harvard University.